Packages become very hard to search once they are bundled onto pallets or loaded into containers. U.S. officials believe the bombmaker was Ibrahim al-Asiri, a Saudi member of al-Qaeda's Yemeni arm, known as al-Qaeda in the Arabian Peninsula. Al-Asiri is thought to have fabricated the underpants bomb that failed to detonate last Christmas on board a plane bound for Detroit. That plot failed in part because the bomber, Nigerian Umar Abdulmutallab, was overpowered by fellow passengers. On this occasion, al-Asiri sought to eliminate human error by launching his bombs into the global cargo network from close to home. The smooth-functioning international freight system would be his delivery mechanism. To send a package from the UPS or FedEx facilities in Sana'a, you need only show an ID card and provide a full nameno different from most places in the world. The first bomb was taken to FedEx's Sana'a office in the middle of last week; the second was dropped off at the UPS office a few doors away. Both stores are in Hadda Street, an area popular with wealthy Yemenis who frequent its many Western-style restaurants. It is not clear if the packages underwent any kind of security check either at the courier offices or at Sana'a airport. Typically, couriers in Sana'a do a visual inspection of the contents before they are sealed. At the airport, the Ministry of the Interior, which controls airport security, runs all outgoing cargo packages through X-ray machines, according to a longtime employee of an international courier company in Sana'a. The second package, en route from Yemen to UPS's cargo hub in Cologne, Germany, also passed through Dubai. If the initial screening in Sana'a was lax, in Dubai it seems to have been spotty at best. Cargo moving through Dubai International Airport is set aside for a 24-hour "cooling" period before continuing on to its final destination. But there usually isn't much more of a security check on individual parcels, according to the U.A.E. 's General Civil Aviation Authority. "Usually, the transit cargo does not get screened anywhere in the country unless there is a suspicion," said Saif al-Suaidi, director general of the aviation authority, according to media reports from the region. At every step of the journey, the bombs became harder to detect through screening. 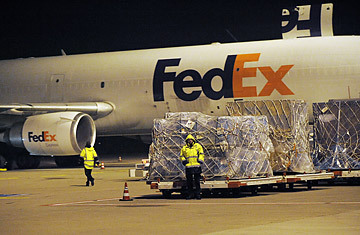 When they get to major hubs for air couriers, like Cologne for UPS and Dubai for FedEx, packages headed for the same destination are bundled with others and shrink-wrapped onto a pallet or loaded into a special airfreight container and sealed; once inside, the cargo becomes difficult to screen or inspect. Only specialized machines can provide a detailed view inside multiple packages. Yet 75% of all cargo on wide-body jets is on pallets or in containers. From the hub in Cologne, the UPS package traveled in a container on a Boeing MD-11 to another cargo facility at East Midlands airport in Britain, where it awaited departure to Philadelphia and eventually Chicago. On an intelligence tip, possibly from a Saudi source, passed on to the British security services, local police checked the hold of the plane and found the package. Initially, however, it tested negative for explosives, and the flight was cleared for departure. Only after the second package was found at the FedEx facility in Dubai on the same tip and tested positive for explosives did British security services take another look at the UPS package and identify the bomb. Authorities have been aware of the threat from cargo traveling on passenger jets for years. Earlier this year, the TSA told the Government Accountability Office, "The security threat posed by terrorists introducing explosive devices in air-cargo shipments is significant, and the risk and likelihood of such an attack directed at passenger aircraft is high." As long ago as 2007, the GAO warned the TSA that it was putting the entire supply chain of air cargo in jeopardy by insufficiently addressing that risk. But that's hard to do. Even if U.S. procedures were perfect, foreign governments may have different ideas about how and whether to screen cargo. The most damning finding in the June GAO report was that the TSA has no way of telling whether the screening methods of other countries are effective at detecting the kinds of bombs al-Qaeda is now producing. The TSA doesn't name and shame the problem countries, a practice Markey of Massachusetts says shows "our government has [not] been tough enough on them to establish standards." But even countries with sophisticated facilities don't necessarily screen everything. In the past, Britain has said it screens 100% of cargo on passenger jets, but it has emerged that, like Dubai, it doesn't scan transiting cargo. TSA is lobbying foreign governments to get security introduced as a supply-chain concept. Technology could help, but only to some extent. TSA has approved 77 technologies from various manufacturers for use in screening cargo. Unfortunately, most don't have a big enough opening to handle large pallets or containers, and those that do are either too expensive or can't be produced in bulk. TSA's Sammon told Congress in June that he and his colleagues "share the committee's concern about the pace to develop and approve new technologies." There are devices that can scan every container for explosives before they are loaded into the cargo plane, even without unpacking them. But a single machine costs more than $10 million, and at least five to 10 minutes are needed to check each shipment. Given multiple global departure points, the cost would be crippling. One option is for the TSA to pass some of the responsibility on to cargo carriers: it could, for example, require carriers coming to the U.S. to screen all their cargo. But until now, the TSA has concluded that doing so would "unduly impede the flow of commerce." The fundamental problem, however, is that screening doesn't automatically lead to safety. Al-Qaeda is good at finding weaknesses; al-Asiri, the suspected bombmaker in Yemen, seems particularly creative at doing so. "If the only way to find these things is to open every box, we just can't do it," says Steve Alterman of the Cargo Airline Association. "It's impossible." He's right, of course, unless you want the threat of terrorism to bring international trade to a standstill. But that may be the week's scariest revelation of all.